The Bay Bridge is an impressive site. 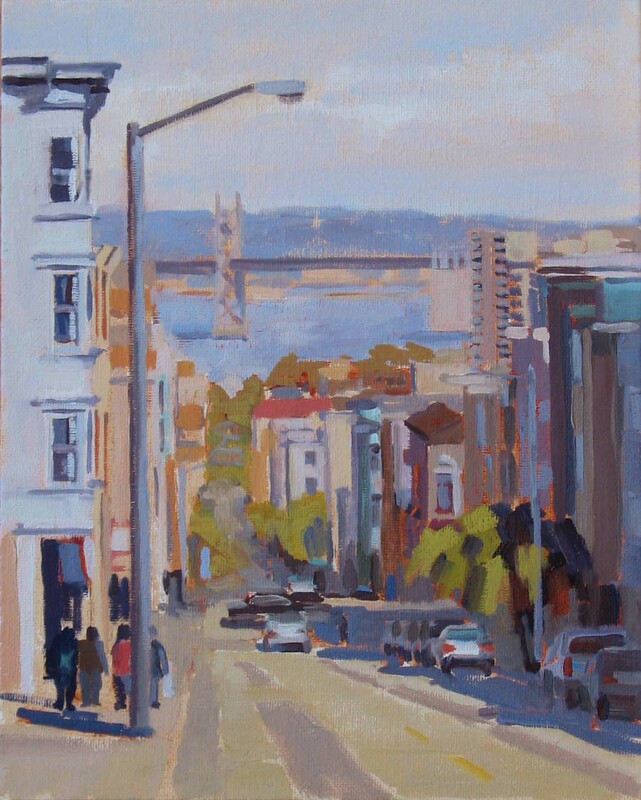 You can catch a glimpse of the bridge from many streets in San Francisco. It's actually a pair of bridges spanning the San Francisco Bay between San Francisco and Oakland. A western span connects downtown San Francisco to Yerba Buena Island and an eastern span connects the island to Oakland. It has one of the longest spans in the world, which it feels like when you're driving across it. 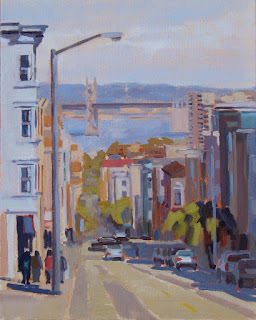 My painting shows the Bay Bridge in the distance on a street in San Francisco. In the foreground, on the left you can see a typical San Francisco building with curved corner windows. 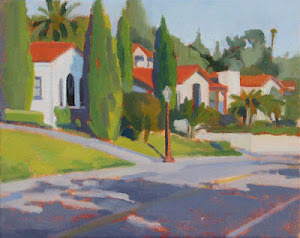 When painting cityscapes it's difficult to decide how much detail to include in the painting. I simplify the information while trying to suggest a sense of depth and space. Then I hope to find a balance that works in the painting. We spent Christmas in La Jolla with my family. The weather was beautiful, 80 degrees, and we were half a block from the Windansea beach. 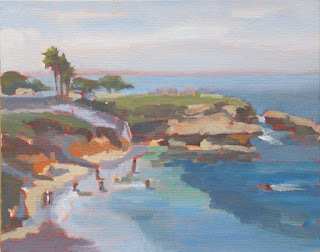 We were also near the Cove, a swimming and diving beach that is sheltered by sandstone cliffs. La Jolla Cove has some of the clearest water of all San Diego beaches. It is also part of the San Diego La Jolla Underwater Park Ecological Reserve . In my painting above, the shallow areas of the water are emerald green with some yellow hues. As the water gets a little deeper the color turns ultramarine blue with some gray tones. On clear days along the ocean front, there is usually a line of reddish-purple haze near the horizon line.